Shree Ramkrishna Netralaya has well equipped Contact Lens clinic with full range of Contact Lenses. What investigations are required ? Contact lens users are plenty. With prolonged working hours you may face few problems. Contact lens wearers are susceptible to a variety of pathological conditions that are either directly or indirectly linked to contact lens use. These conditions can be loosely grouped into three categories: hypoxia, reduced oxygen supply; allergic reactions and infections; and dry eye. Both soft and hard contact lens wearers can be affected by any of these conditions. Hypoxia : Hypoxia, an insufficient supply of oxygen to the cornea , is the underlying cause of most complications of contact lens wear. When you place a contact lens over the eye, it limits the amount of air, or oxygen that can reach the eye. This can lead to red, tired eyes and lessen your tolerance for long-term contact wear. Related symptoms include a lack of tolerance for long periods of contact lens wear; discomfort, especially a feeling of grittiness; and blurred vision, especially toward the end of the wearing period. To treat hypoxia, increase the water content of the lens. Do this by periodically removing the lenses and allowing them to rehydrate in contact lens solution. Or, consider changing from an extended wear to a daily wear lens, reduce the thickness of the lens or change the permeability of the lens material. If you have redness stop using contact lenses and contact your ophthalmologist. 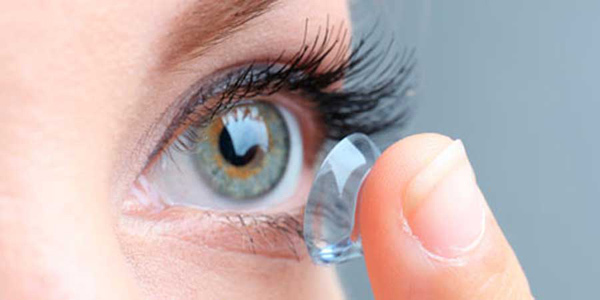 Infections : Contact lens wear can cause infections in the eye most often in response to having bacteria, pollen, or chemical - cosmetics, for example - transfer from the lens to your eye. Occasionally, these infections are a result of lenses that are too tight or too loose. A very common form of bacterial eye infection is bacterial conjunctivitis, but most people know it as "pink eye." Bacterial infection symptoms usually include redness, itching and stickiness of your eyes, especially upon waking. Symptoms may also include a dark yellow or greenish discharge. Fungal keratitis is of growing concern amongst contact lens wearers, and is a serious and painful corneal disease caused by a fungal organism. There is also occurrence of infection by organism called acanthamoeba.To avoid this do not wash your lenses with tap water and use only prescribed lens solutions. Avoid eye infections by consistently complying with lens care regimen, especially disinfecting the lens regularly. Also, avoid exposing lenses to contaminated water . If you get an infection, stop wearing your lenses and see your doctor, who may prescribe an anti- infective eye drop. Dry Eye Syndrome : Dry eye is a condition to which soft contact lens wearers are often susceptible. Soft lenses tend to draw moisture or tears out of the eye which leads to a gritty, burning feeling. Or, simply put, makes your eyes feel dry. Dry eye symptoms include redness, itchiness, burning or stinging in the eye and sometimes sensitivity to light. Generally speaking, it feels like there's something in the eye causing general discomfort. If dry eye persists, consider using artificial tear drops and not wearing your lenses until the conditions improve. If redness persists, see your doctor, as redness can be a key symptom of eye infections as well. Wash hands with soap and water, and dry them using a lint-free method before handling lenses. Wear and replace lenses according to the schedule prescribed by your doctor. Follow the specific lens cleaning and storage guidelines provided by your doctor and the solution manufacturer. Keep the contact lens case clean and replace every 30 days. Remove the lenses and consult your doctor immediately if you experience symptoms such as redness, pain, tearing, increased light sensitivity, blurry vision, discharge, or swelling. Most of these pathologies are preventable with properly fitting contact lenses, appropriate lens maintenance and replacement, and care to prevent contamination of the lenses. Contact your eye care professional if these symptoms persist as some conditions can lead to permanent sight loss. Super Speciality Eye Care Dosti Imperia, 1st Floor, Opposite RMall, Near Chitalsar Police Station, Ghodbunder Road, Thane (W). Monday to Saturday : 9 a.m. To 9 p.m.